If you're like me, when you find a place you really like, you want to tell your friends you're there. Maybe it's a new restaurant, a beautiful hiking trail or an amazing live show. Starting today, you can immediately tell people about that favorite spot with Facebook Places. You can share where you are and the friends you're with in real time from your mobile device. 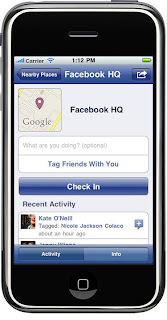 To get started, you'll need the most recent version of the Facebook application for iPhone. You also can access Places from touch.facebook.com if your mobile browser supports HTML 5 and geolocation.Places is currently available in a few select countries (including the US, UK and Japan) with many more on the way. 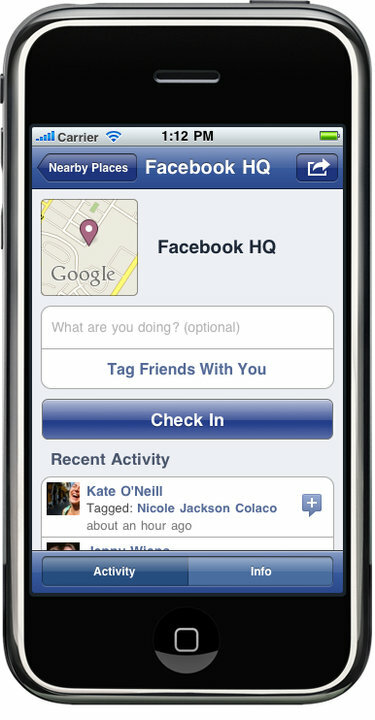 Go to Places on the iPhone application or touch.facebook.com site and then tap the "Check In" button. You'll see a list of places near you. Choose the place that matches where you are. If it's not on the list, search for it or add it. After checking in, your check-in will create a story in your friends' News Feeds and show up in the Recent Activity section on the page for that place.